PACO has over 25 years of experience in Slurry engineering and designing Site Specific Slurry Programs on the West Coast and in Canada. 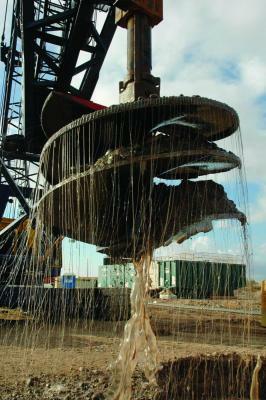 Let us design a slurry system program for your wet shaft drilling utilizing CETCO’s SHORE PAC Polymer Slurry. We can calculate an estimated Slurry viscosity to drill with as well as any recommended additives. We also calculate in estimated over-break, fluid loss, and slurry recovery. With this we can offer you an estimated amount of products you may need to complete a project with corresponding costs. This is not a bid/quote per say but an estimation. Along with the calculations/costs page we offer site specific recommendations relative to mixing and drilling with SHORE PAC Polymer Slurry. This slurry system plan covers mix water, polymer mixing, monitoring, trouble shooting, and complete testing of the slurry relative to Caltrans or other entities specifications.